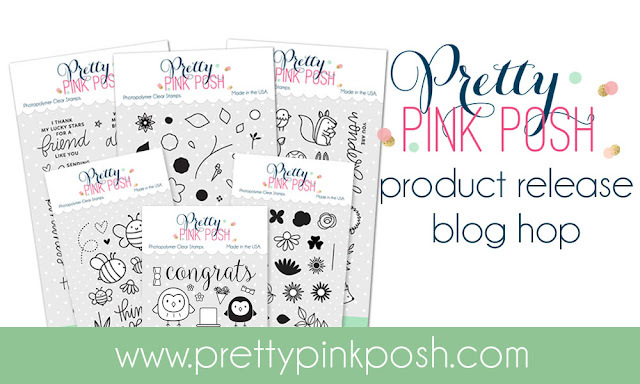 I am super excited to be a part of the Pretty Pink Posh May Product Reveal Blog Hop. The stamps, dies and sequins being released are nothing short of amazing! I can't get over how many stamps are included in each stamp set! And how perfectly the dies cut out the stamped images! And how pretty the sequin colors are! It is just a stunning release! Make sure you read all the way to the bottom of the post because there is a giveaway if you comment on all the posts along the hop! I started with the Scallop Hexagons Die set and I cut each hexagon from a different yellow cardstock. Next I used the Bee Friends Stamp Set to stamp a bunch of images on white cardstock. In this one little stamp set you get FOUR bee images, two bee trails, THREE different hearts, two flowers and two stems and a lovely script sentiment! That's a ton packed into one set! After coloring the stamped images, I used the coordinating Bee Friends Die Set to cut them out. After cutting out the bees, I used the same dies to cut them out of vellum. Next I cut off the wings of the cardstock bees and then adhered the cardstock bee bodies to the vellum. Once I popped them up with foam tape you could see the sweet vellum wings. I finished this card off with some 6mm Champagne Sequins and 4mm Champagne Sequins. For my next card I again used the Scallop Hexagons Die set, but this time I used it to create a vellum shaker window, which I filled with Spring Meadow Sequin Mix. I also used the Bold Blooms Stamp set to create some stamp layering flowers. Again, it is so awesome to see how many layered flowers you can create with this stamp set! I used the Bold Blooms Coordinating Die set to cut out my flowers and adhered them to my card. I finished my card off with a heat embossed sentiment from the Thoughtful Greetings Stamp Set and a few more sequins from the Spring Meadow Sequin Mix. Ok, now on to the GIVEAWAY! 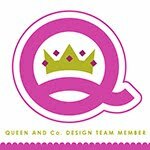 Pretty Pink Posh is giving away FOUR $25 gift certificates to their shop! Two winners will be drawn from yesterday's hop and two from today's! So be sure to leave comments on ALL the blogs! Your next stop is the incredibly talented Heather Hoffman. Here is a list of all the blog participants in case you get lost along the way. Rebecca Keppel-----------------> You are HERE! Now hurry and hop along! You have until 11:59pm on May 17th to leave all your comments. Thanks so much for stopping by and good luck! Rebecca, your bees and blooms are so cute. Great cards! Very clever using vellum for the bees' wings! Wonderful cards, love the bees! Adorable cards! Especially love the bright pop of yellow on the bee card. Your cards are so sweet, Rebecca! I love the great color and the little bees are adorable! Those flowers are so cheerful! Beautiful cards. 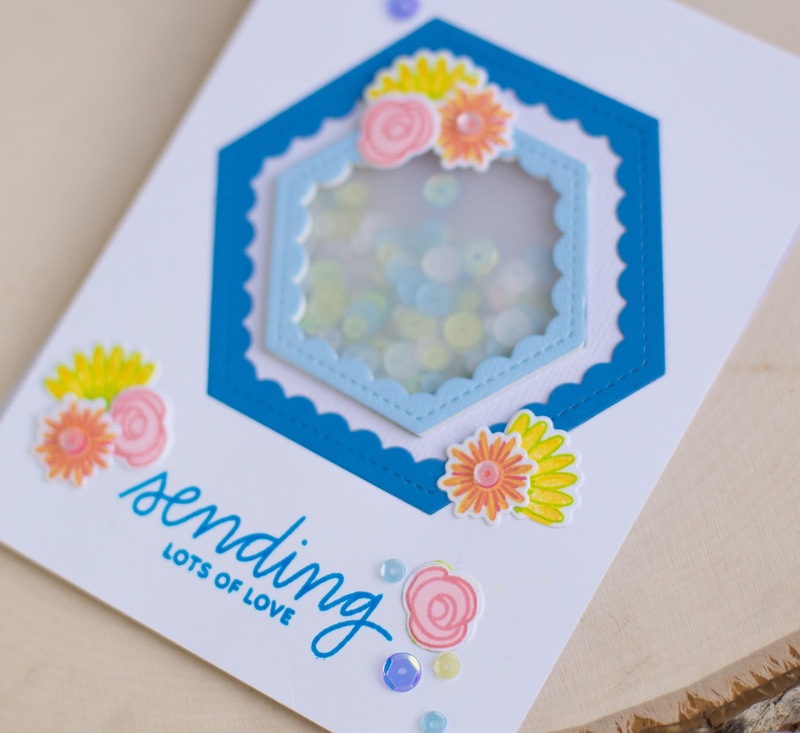 So cute--love how you used the hexagons. Love those Scallop Hex Dies! Awesome cards! The bees and flowers are adorable! Both these cards are so cheery and bright. Love that you used vellum for the bee wings. WOW Rebecca, both cards are fantastic. Love the hexagon dies and the colours you used on both are awesome! Love the use of the hexagons! Precious and cute! Thanks for the inspiration! I have to get this scalloped hexagon set! 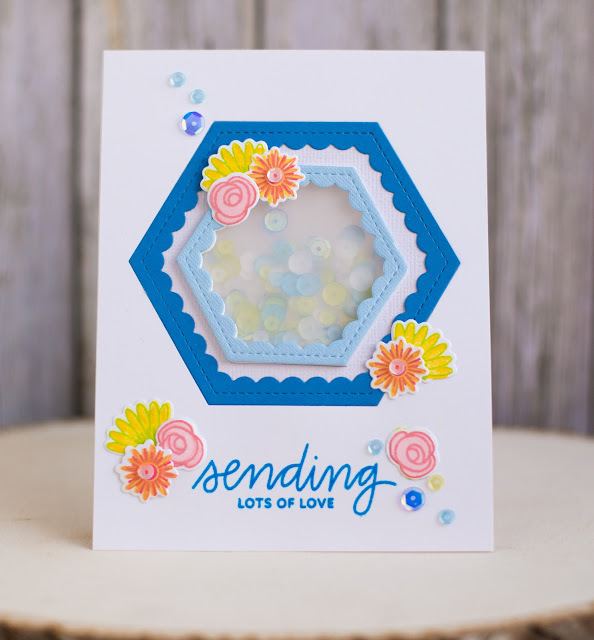 Every card made with this scalloped hex is awesome! I must have it! Such happy colors on your adorable cards! Those dies are so fun! Loving this blog hop with all of it's talent and inspiration! Thanks for sharing yours! cute cards using the new release. The bees really caught my eye...they would make anyone happy! and I love the blues. Love the bees on the hexagon shapes! My favorite is your second card, though. The Bold Blooms stams and matching dies are so nice for small flowers. Your colors are fantastic! Both cards are great. Love how something as simple as turning the hexagon a quarter turn gives it a whole new dimension. Love these dies and the bees...too sweet! Wonderful bright colors. Those bees are so happy in their work. Love how many items are in each set. Bonus! Thanks for hopping with us. These are so sweet! I just love those scallop hexagons! Loving how you used the hexagon dies....especially the bee one. TOO cute!!!! Very cute cards. I like the hexagon shaker. 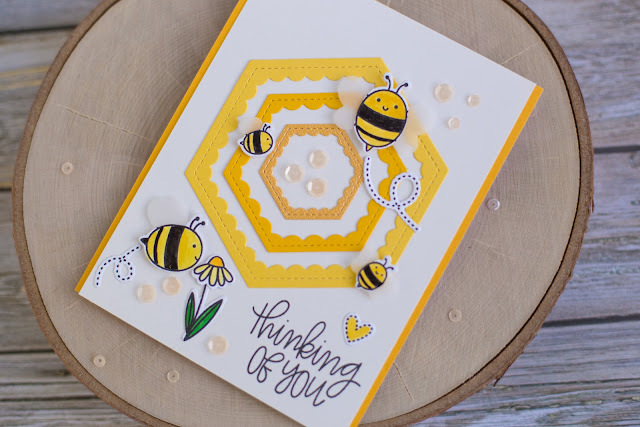 Great use of those hexagon dies, the shaker is so fun, and the bee card so cute! Beautiful use of the hexagon dies on each of these cards. Love how you used the hexagon dies. Oh my gosh -- love the bee card!! The use of the vellum for the wings is brilliant!! The whole card is just so happy and upbeat! May have to get those stamps and dies! love these! great ways to used the hexagon dies and love your bright colors! What a neat way to use those hexagons!!! Very nice fun cards! That scalloped hex die is so versatile! I love it with the bees! For whatever reason, bee cards always make me smile. And your card is just too sweet. Adorable cards. I love the bee card!! They are colorful. There's something about those bees...they just make me happy! Those little bees are so cute! The hexagons are perfect for a 🐝 hive!!! Love it! Wow! Beautiful and sweet cards!!! Oh my goodness - super cute cards!! Love the hexagon shaker!! So awesome! I love the different ways you use the hexagon dies. Wow... what fun and vibrant cards. Love your style! !